Southeast Library, scheduled for renovation. The city has launched two major Eastern Market community projects: the renovation of both the Southeast Library and the Redesign of the Eastern Market Metro Plaza. The initial community meeting to unveil plans and time line regarding the library will take place on Tuesday (see The Week Ahead below). Last week, the first meeting of the 13 member* Eastern Market Metro Plaza Advisory Team (EMMPAT) took place on Monday in the North Hall of Eastern Market. The Advisory Team was appointed by DC’s Department of General Services (DGS); DGS will be the project manager. The meeting was largely organizational and informational. The team elected as co-chairs Martin Smith, Executive Director of Barracks Row Main Street, and Madeleine Odendahl, Executive Director of Eastern Market Main Street. David Perry, Chair of the Board of Directors of Barracks Row Main Street, even though not on the Advisory Team, announced his intention to be at every meeting – which seems to indicate his belief that future meetings of the Advisory Team should be open to the public. Capitol Hill Corner strongly shares and supports this belief. The mission of the Advisory Team is to stimulate, encourage and ensure community involvement in the redesign process. To that end, DGS and the EMMPAT co-directors will determine a schedule for community meetings every two months, with the first occurring in the next few weeks. In addition, a website to solicit community input will be on line soon. At Monday’s meeting, DGS presented several concept options regarding how to spend the $4.5 million currently available – CM Charles Allen, got the funding included in the budget. EMMPAT’s loose consensus was that the initial focus should be on Parcel 1 – currently the site of both a neighborhood children’s improvised playground and a drug-user-seller habitat. As if that were not enough, additional impetus for favoring Parcel 1 is the additional private funding available from a deal cut with the community by the developers of the Hine Project. As part of the community benefits to offset the project’s increased density and massing, the developers pledged $50,000 for Metro Plaza landscaping and $75,000 for a playground on Parcel 1. The funds were later combined for use on the playground. The basic concept for the redesign was created by architect Amy Weinstein of Escoff & Associates. In 2013, Weinstein was awarded a $500,000 contract by Barracks Row Main Street, funded by a Congressional earmark. (See here: https://bit.ly/2OcPVg7) Weinstein subsequently produced a long term $45 million plan in December of that year. That design included an entrance on the Plaza to an expansion of Southeast Library which would be built under 7th Street – a plan which DC Public Libraries later nixed as being unfeasible. 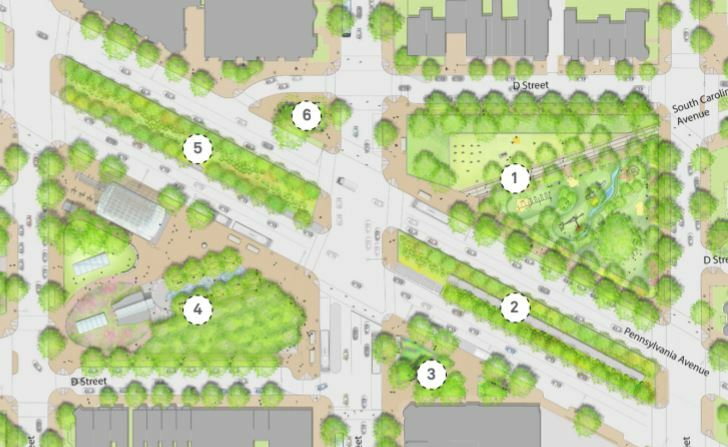 The Plaza redesign plan involves multiple city and federal agencies, including DGS, the Departments of Parks and Recreation, Transportation, Energy and Environment, the Office of Planning, the Office of Zoning, DC Public Libraries, and the Historic Preservation Review Board. Federal agencies include the National Park Service, National Planning Commission, and the US Commission on Fine Arts. Members of the Design/Build Team for Metro Plaza development: Keystone Plus Construction, MOVA Design Partners, LandDesign, AMT Civil Engineering; Simpson, Gumpertz & Heger Structural Engineering and Setty MEP Engineering. ANC6B’s Executive Committee will meet at 7:00pm in Hill Center, 921 Pennsylvania Avenue, SE, to set the agenda for November 2018 ANC meeting. Community Meeting on Redesign of Southeast Library. 7:00pm at Hill Center, 921 Pennsylvania Avenue, SE. 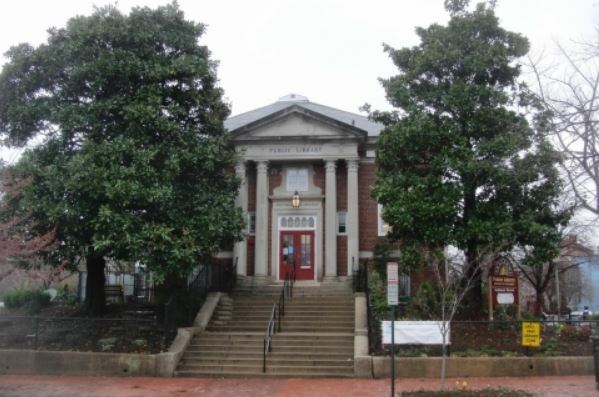 Plans to renovate the Library, project timeline and the process for community engagement. Plenty of politicians and business people on the committee. Don’t see any just citizens (who are the main users of the plaza and library). Hallelujah to staring work on Parcel 1. I’d like to know what real steps will be taken to get rid of the open air drug market. What’s the use of a nice playground if it’s going to be surrounded by people who are strung out, passed out, and the whole area strewn with litter? I agree, and it only seems to be getting worse. Witness the awful story about the indecent exposure at Summit2Soul earlier this week. Then getting off the metro today we were warned about an ongoing “brawl” on the platform at Eastern Market. I’m not sure what is causing the issues to become worse but it’s getting to the point where I am actively avoiding the entire metro plaza down to E St.